Text Neck? Could Phones Be The Cause Of Your Neck Pain And More? This position puts a lot of extra weight on your neck and upper back – for approximately every 3cm your neck move forwards it doubles in weight. When your head is looking down at your phone, it can be tripled in weight which can add an extra 10 kg of pressure to your neck and upper back. This additional pressure changes the way your whole neck works, muscles become tight, ligaments are stretched beyond their usual movement, and your joints become fixated. All these changes can cause pain and other symptoms. There are many side effects of text neck, most don’t occur quickly but develop over time. Headaches are another common symptom, tension, tightness and loss of mobility through the neck can cause head pain. Proximal cross syndrome is the technical name for the posture of text neck when it becomes standard posture even when you’re no longer using your phone. Long term this posture causes tightness through the chest and upper back muscles and weakness of your mid back and neck muscles. Difficulty breathing can occur when you are slumped forward and taking shallow breaths due to your shoulders and rib cage restricting the expansion of your lungs. Thoracic Outlet Syndrome is when muscles or joints in your shoulder compress a nerve or artery causing pins and needles, numbness or weakness in your arm. This commonly occurs when sleeping on one side or doing a task with your hands above your head. Limit phone and tablet use. It might be easier to look something up or quickly check emails or Facebook on your handheld device but if you plan to be online for any significant amount of time use your computer – make sure it is set up correctly! Look with your eyes. It is easier to look down with your whole head, but you can limit it by moving your eyes more than your neck. Neck flexibility exercises. Simple exercises and stretches such as neck rolls or shoulder stretches will improve the movement of your neck and are especially useful after long periods on a computer or phone. Mid-back strengthening exercises. Strengthening the muscles between your shoulder blades may help improve your posture. The easiest one is to merely squeeze your shoulder blades together and hold for 10 seconds. Move every 30 minutes. Make sure to get up, walk around and move your neck regularly. If you know you are going to be on your device for an extended period set a timer for every 30 minutes to remind you to get moving. Finally and most importantly get your spine checked by your Ipswich chiropractor or another health professional. Improving your posture with exercises and stretches can only improve your pain so much if you have underlying dysfunction and reduced movement of your spine. Is technology to blame for your bad posture, neck pain and headaches? Technology is something we all rely on more every day and makes many tasks more manageable. One thing technology does not help us with is our posture. Whether on the computer or using your phone or tablet it seems to slip our minds to sit up straight. 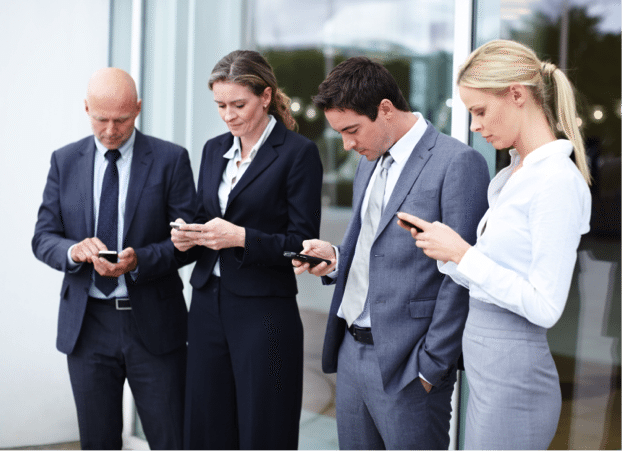 When using our cellphone we all end up in a slumped over posture looking down – hence the term Text Neck. Text neck adds a lot of extra pressure through the joints and muscles in your neck and upper back; this can lead to neck pain, shoulder pain, headaches and even difficulty breathing.